To understand the use of multielectrode array (MEA) chips in neurophysiology labs to record extracellular local field potentials in vitro. What is Multi Electrode Array? Multielectrode arrays (MEAs) or microelectrode arrays are devices that contain multiple plates or shanks through which neural signals are obtained or delivered, essentially serving as neural interfaces that connect neurons to electronic circuitry. 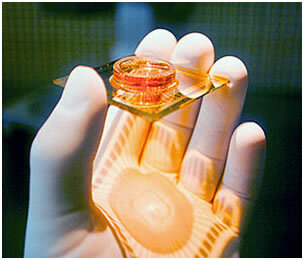 There are two general classes of MEAs: implantable MEAs, used in vivo, and non-implantable MEAs, used in vitro. Neurons and muscle cells create ion currents through their membranes when excited, causing a change in voltage both inside and outside the cell. When recording, the electrodes on an MEA transduce the change in voltage from the environment carried by ions into currents carried by electrons (electronic currents). When stimulating, electrodes transduce electronic currents into ionic currents through the media. This triggers the voltage-gated ion channels on the membranes of the excitable cells, causing the cell to depolarize and trigger an action potential, as in a neuron. The size and shape of a recorded signal depend upon several factors: the nature of the medium in which the cell or cells are located (e.g. the medium’s conductivity, capacitance, and homogeneity); the nature of contact between the cells and the MEA electrode (e.g. area of contact and tightness); the nature of the MEA electrode itself (e.g. its geometry, impedance, and noise); the analog signal processing (e.g. the system’s gain, bandwidth, and behavior outside of cutoff frequencies); and the data sampling properties (e.g. sampling rate and digital signal processing). The standard type of in vitro MEA comes in a pattern of 8 x 8 or 6 x 10 electrodes. Electrodes are typically composed of indium tin oxide or titanium and have diameters between 10 and 30 μm. These arrays are normally used for single-cell cultures or acute brain slices. One challenge among in vitro MEAs has been imaging them with microscopes that use high power lenses, requiring low working distances on the order of micrometers. In order to avoid this problem, “thin”-MEAs have been created using cover slip glass. These arrays are approximately 180 μm allowing them to be used with high-power lenses. In another special design, 60 electrodes are split into 6 x 5 arrays separated by 500 μm. Electrodes within a group are separated by 30 um with diameters of 10 μm. Arrays such as this are used to examine local responses of neurons while also studying functional connectivity of organotypic slices. Spatial resolution is one of the key advantages of MEAs and allows signals sent over a long distance to be taken with higher precision when a high-density MEA is used. These arrays usually have a square grid pattern of 256 electrodes that cover an area of 2.8 by 2.8 mm. In order to obtain quality signals electrodes and tissue must be in close contact with one another. The perforated MEA design applies negative pressure to openings in the substrate so that tissue slices can be positioned on the electrodes to enhance contact and recorded signals. The nature of dissociated neuronal networks does not seem to change or diminish the character of its pharmacological response when compared to in vivo models, suggesting that MEAs can be used to study pharmacological effects on dissociated neuronal cultures in a simpler, controlled environment. A number of pharmacological studies using MEAs on dissociated neuronal networks, e.g. studies with and without effects of inhibition. What are extracellular field potentials? The extracellular field potential is the electrical potential produced by cells, e.g. nerve or muscle cells, outside of the cell. Electrophysiological studies investigate these potentials using extracellular microelectrodes. In these experiments the extracellular field potential will be detected as an electrical potential whose source and composition is often ambiguous, making its interpretation difficult. Individual nerve cells neurons may produce spikes seen as peaks of some tens to hundreds of microvolts. Contributions from neighboring neurons may overlap, producing extracellular potentials of up to several millivolts. The local field potential is believed to represent the synchronised input into the observed area, as opposed to the spike data, which represents the output from the area. In the LFP, quick fluctuations in the potential difference are filtered out, leaving only the slower fluctuations. The quick fluctuations are caused by the short inward and outward currents of the action potential. Therefore the action potential plays no part in the LFP. The LFP is thus composed of the more sustained currents in the tissue, typical of the somato-dendritic currents. The major slow current is the postsynaptic potential (PSP). It was thought until recently that EPSPs and IPSPs were the exclusive constituents of LFPs. 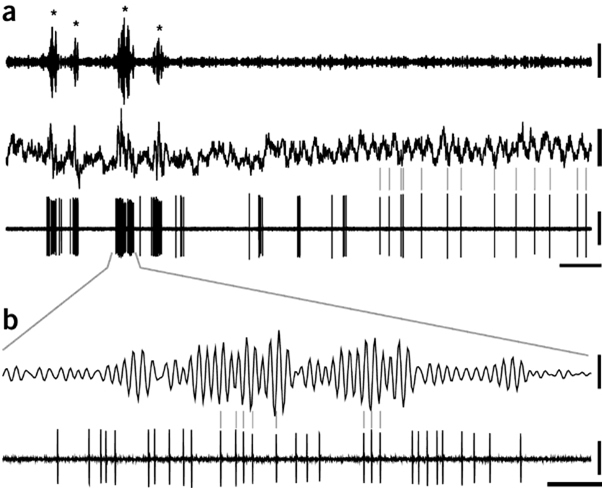 However, phenomena unrelated to synaptic events have been found to contribute to the signal. A sample MEA system can consist of a chip (a silicon substrate supporting thin film platinum wires leading to the electrodes and insulated with a 5 μm thick SU-8 epoxy layer) connected to amplifiers via printed circuit boards (a common commercial example is MEA60 from Multi Channel Systems, Reutlingen, Germany). As in some cases, consider an example: MEA contain 60 conic electrodes covered with a thin platinum film arranged in an 8x8 matrix (without corner electrodes) and spaced by 100 μm center-to-center (Ayanda Biosystems, Lausanne, Switzerland). The electrodes have base diameter of 40 μm and height of 30 μm, with an effective recording area of 1600 μm2. The choice of conic electrodes to record from the inner part of the slice was aimed at preventing the effects of fiber discontinuation and neuronal damage occurring on the surface. A patch-clamp like setup is used to mount the MEA chips and extract extracellular recordings. MEA signals are amplified (x1200) (MEA1060, Multi Channel Systems, Reutlingen, Germany) and sampled at 20 kHz/channel. Field potentials usually ranged between tens of μV to mV. A signal was analyzed only when >10 μV. According to electrophysiological conventions, negative (downward) signals are determined by sink (inward positive) currents indicating membrane excitation.